At the AIWS Conference, Professor Matthias Scheutz – Director of the Human-Robot Interaction Laboratory at Tufts University gave a keynote speech about the potential of AI and robotics technologies and called for ethical provisions for the design of AI systems from the outset to prevent accidental failures. In his speech, Prof. Scheutz showed that the greatest risk caused by AI and robotics technologies is when unconstrained machine learning is out of control where AI systems acquire knowledge and start to pursue goals that were not intended by their human designer. For example, if an AI program operating in the power grid decides to cut off energy in certain areas for better power utilization overall, it will however leave millions of people living without electricity, which consequently turns out to be an AI accidental failure. He also points out as false some common preventive solutions inside and outside the system which he believes are basically insufficient to safeguard AI and robotics technologies. Even with “emergency buttons”, the system itself might finally set its own goal to prevent the shutdown set up previously by human. 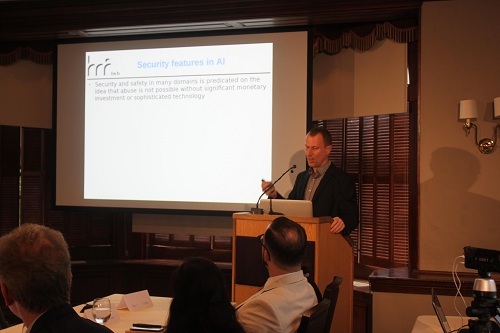 According to Professor Matthias Scheutz, the best way to safeguard AI systems is to really build-in ethical provisions directly into the learning algorithms, the reasoning algorithms, the recognition algorithms, etc. so that the algorithm itself has such provisions. The simple form of “ethical testing” to catch and handle ethical violations was also demonstrated in his presentation. Scheutz is a Professor in Cognitive and Computer Science in the Department of Computer Science, Director of the Human-Robot Interaction Laboratory and the new Human-Robot Interaction Ph.D. program, and Bernard M. Gordon Senior Faculty Fellow in the School of Engineering at Tufts University. He has more than 300 peer-reviewed publications in artificial intelligence, natural language processing, cognitive modeling, robotics, and human-robot interaction. His current research focuses on complex interactive autonomous systems with natural language and machine learning capabilities. He is a member of AIWS Standards and Practice Committee.